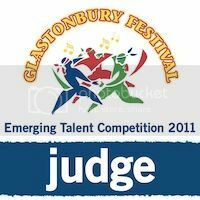 Glastonbury Festival have just announced their Emerging Talent Competition for 2011's festival, giving new unsigned bands across the UK and Ireland the opportunity to win a slot on the main stage. The winner will be in esteemed company - previous winners include Stornoway, We Have Band, the Golden Silvers, the Subways, Ellen and the Escapades and, erm, Scouting For Girls. At BlackPlastic we are always getting contacted by new unsigned acts - Glastonbury's competition represents a fantastic opportunity to get some exposure so if you are a music maker then we strongly recommend you enter. All styles and genres are eligible and entrance is free and surprisingly hassle free - you simply need to enter a link to where your music can be heard. It's worth noting you only have a week to enter - the closing date is 5pm Monday 17 January 2011. BlackPlastic has been selected along with 39 other bloggers to help judge this year's competition and you will have to excuse our blushes as we gush a bit and confess how chuffed we are to have been invited to be associated with such a prize. You can find details on how to enter along with the full list of blogs that are judging over at the Glastonbury Festivals site... Good luck!